All over campus, 23 blue emergency poles stand tall, lit up to serve as a way for students to contact the campus police if they are in trouble. 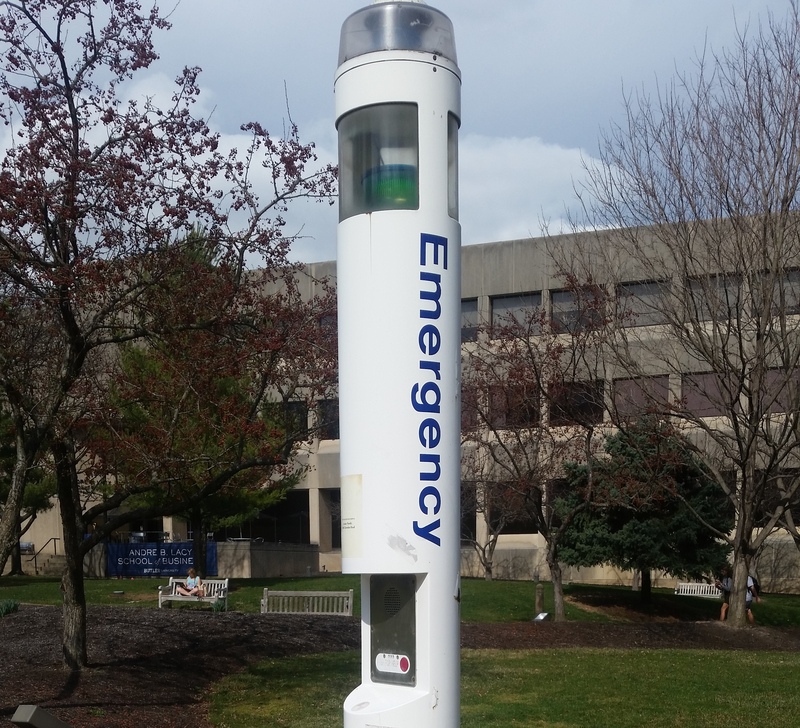 Ninety-two percent of students are familiar with the blue emergency poles on campus, while six percent do not know what they are, according to a Twitter poll of 51 Butler students. Placed by large foot-traffic paths, in Holcomb Gardens and around buildings, the blue beams can be seen during the day and night. The poles include red buttons that directly connect with Butler University Police Department’s dispatch station. It makes a call to the university’s police station, who will then dispatch a police officer to the area immediately. BUPD detective Courtney White experienced some of the blue-pole calls. White said the poles are rarely used for emergency situations. Usually the button hits are accidental, caused by maintenance workers. There are also emergency buttons inside elevators that students sometimes accidentally hit. The hit alerts the police no matter the circumstance. The call starts an open line, and the person can communicate with the officer directly. BUPD is sent the location and time when the pole was hit. The recent university construction projects caused some poles to be taken off-line, due to cut cords and faulty wiring. The construction affected some of the cameras on the poles, but the system still works in an emergency. If the pole’s camera is off-line, the surrounding cameras on campus are moved to see the area. Sometimes people will hit the button while walking when there is no real emergency, White said. Police officers are dispatched anyway, as with any call. It is considered “false reporting,” similar to calling 9-1-1. BUPD goes to the area whenever a button is hit, even if it was accidental. “Officers are sent to the area regardless of whatever the call is, if someone is on the other line or it’s dead air,” White said. First-year psychology major Sarah Vitelli runs by Holcomb Gardens and Hinkle Fieldhouse four times a week. Vitelli said she sees only a few light poles during her run: One by the Holcomb steps to the I Lot and one by Hinkle. First-year secondary English education major Haley Huelsman parks her car in the I Lot, the parking lot across the canal and by the sports fields. Huelsman said she sometimes will walk late at night from I-Lot. She sees three to four blue emergency lights on the path. Huelsman said more lights could be placed by the canal and areas surrounding Fairview House. “I think it is fine for now, but there is always room for improvement,” she said. BUPD checks the emergency light poles to ensure they are working properly, as officers go to the poles and press the buttons for test runs at least once a month. With the construction of a new residence hall and the Lacy School of Business, more emergency light pole stations will be moved or added in the future. As a grandmother, I feel a little more relieved about safety on campus. The blue poles sound like an excellent system that is easy to use and is one that the students can rely on. My thanks to the Butler University campus police.